This article describes room-temperature and high-temperature mechanical properties, as well as oxidation behavior, of a niobium-niobium silicide basedin situ composite directionally solidified from a Nb-Ti-Hf-Cr-Al-Si alloy. Room-temperature fracture toughness, high-temperature tensile strength (up to 1200 °C), and tensile creep rupture (1100 °C) data are described. The composite shows an excellent balance of high- and low-temperature mechanical properties with promising environmental resistance at temperatures above 1000 °C. The composite microstructures and phase chemistries are also described. Samples were prepared using directional solidification in order to generate an aligned composite of a Nb-based solid solution with Nb3Si- and Nb5Si3-type silicides. The high-temperature mechanical properties and oxidation behavior are also compared with the most recent Ni-based superalloys. 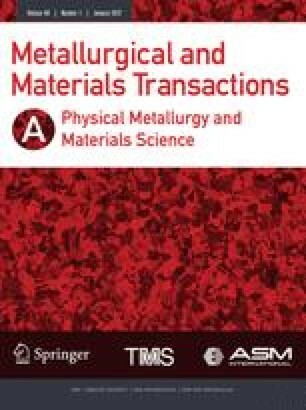 This composite represents an excellent basis for the development of advanced Nb-based intermetallic matrix composites that offer improved properties over Ni-based superalloys at temperatures in excess of 1000 °C.